Some time necessarily passed before he could get together a sufficient number of cut-throats and renegades from justice to enable him wholly to defy the authorities; but at last he succeeded in rallying a strong force to his standard of blood, and became the terror of the whole region, equaling in boldness and audacity the terrible Joaquin, of California notoriety in after years. His headquarters were in the almost impregnable fastnesses of the Sangre de Cristo Mountains, from which he made his invariably successful raids into the rich valleys below. There was nothing too bloody for him to shrink from; he robbed indiscriminately the overland coaches to Santa Fe the freight caravans of the traders and government, the ranches of the Mexicans, or stole from the poorer classes, without any compunction. He ran off horses, cattle, sheep,— in fact, anything that he could utilize. If murder was necessary to the completion of his work, he never for a moment hesitated. Kidnapping, too, was a favorite pastime; but he rarely carried away to his rendezvous any other than the most beautiful of the New Mexican young girls, whom he held in his mountain den until they were ransomed, or subjected to a fate more terrible. In 1864 the bandit, after nearly ten years of unparalleled outlawry, was killed by Tobin. Tom had been on his trail for some time, and at last tracked him to a temporary camp in the foothills, which he accidentally discovered in a grove of cottonwoods, by the smoke of the little camp-fire as it curled in light wreaths above the trees. Tobin knew that at the time there was but one of Espinosa’s followers with him, as he had watched them both for some days, waiting for an opportunity to get the drop on them. To capture the pair of outlaws alive never entered his thoughts; he was as cautious as brave, and to get them dead was much safer and easier; so he crept up to the grove on his belly, Indian fashion, and lying behind the cover of a friendly log, waited until the noted desperado stood up, when he pulled the trigger of his never-erring rifle, and Espinosa fell dead. A second shot quickly disposed of his companion, and the old trapper’s mission was accomplished. To be able to claim the reward offered by the authorities, Tom had to prove, beyond the possibility of doubt, that those whom he had killed were the dreaded bandit and one of his gang. He thought it best to cut off their heads, which he deliberately did, and packing them on his mule in a gunny-sack, he brought them into old Fort Massachusetts, afterward Fort Garland, Colorado, where they were speedily recognized; but whether Tom ever received the reward, I have my doubts, as he never claimed that he did. Tobin died in 1904, gray, grizzled, and venerable, his memory respected by all who had ever met him. James Hobbs, among all the men of whom I have presented a hurried sketch, had perhaps a more varied experience than any of his colleagues. 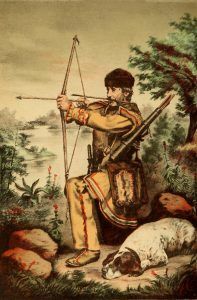 During his long life on the frontier, he was, in turn, a prisoner among the Indians, and held for years by them; an excellent soldier in the war with Mexico; an efficient officer in the revolt against Maximilian, when the attempt of Napoleon to establish an empire on this continent, with that unfortunate prince at its head, was defeated; an Indian fighter; a miner; a trapper; a trader, and a hunter. Hobbs was born in the Shawnee nation, on the Big Blue River, about 23 miles from Independence, Missouri. His early childhood was entrusted to one of his father’s slaves. Reared on the eastern limit of the border, he very soon became familiar with the use of the rifle and shot-gun; in fact, he was the principal provider of all the meat which the family consumed. In 1835, when only 16 years-old, he joined a fur-trading expedition under Charles Bent, destined for Bent’s Fort, Colorado on the Santa Fe Trail over Pawnee Fork without special adventure, but there they had the usual tussle with the Indians, and Hobbs killed his first Indian. Two of the traders were pierced with arrows, but not seriously hurt, and the Pawnees — the tribe which had attacked the outfit — were driven away discomfited, not having been successful in stampeding a single animal. When the party readied the Caches, on the Upper Arkansas River in Kansas, a smoke rising on the distant horizon, beyond the sand hills south of the river, made them proceed cautiously; for to the old plainsmen, that far-off wreath indicated either the presence of the Indians, or a signal to others at a greater distance of the approach of the trappers. “But I’ll get her,” answered Hobbs, and he called to his closest comrade, John Baptiste, a boy of about his own age, to go and get his pack-mule and come along. “All right,” responded John; and together the two inexperienced youngsters crossed the river against the protests of the veteran leader of the party. After a chase of about three miles, the boys came up with the cow, but she turned and showed fight. Finally Hobbs, by riding around her, got in a good shot, which killed her. Jumping off their animals, both boys busied themselves in cutting out the choice pieces for their supper, packed them on the mule, and started back for the train. But it had suddenly become very dark, and they were in doubt as to the direction of the Trail. Soon night came on so rapidly that neither could they see their own tracks by which they had come, nor the thin fringe of cottonwoods that lined the bank of the stream. Then they disagreed as to which was the right way. John succeeded in persuading Hobbs that he was correct, and the latter gave in, very much against his own belief on the subject. They traveled all night, and when morning came, were bewilderingly lost. Then Hobbs resolved to retrace the tracks by which, now that the sun was up, he saw that they had been going south, right away from the Arkansas River. Suddenly an immense herd of buffalo, containing at least two thousand, dashed by the boys, filling the air with the dust raised by their clattering hoofs, and right behind them rode a hundred Indians, shooting at the stampeded animals with their arrows.